I denne konserten, tar Polaris 5 deg i en reise gjennom den franske repertoaren for vindkvintett ( fløyte, obo, klarinett, horn og fagott) fra 1800- tallet til begynnelse av 1900 – tallet. I dette programmet skal du høre stykker fra Claude Debussy og fra mindre kjente componenter som Pierné, Ibert og Taffanel. Kvinttet ble dannet av 5 musikerne med forskjellige land. : Evgeniya Leonova er fra Russaland, Miland Adamovic er fra Serbia, Elske Groen fra Nederland, Laura Loviskova fra Slovakia og Alexis Baldos fra Frankrike. Alle musikerne bringe deres erfaringer og bakgrunn og dele det samme glede av å spille med vindinstrumenter. Elske Groen was born in 1985. She began learning horn at the music school in her hometown and played in the local harmony band. She studied at The Hague with Martin van der Merwe before entering the class of Herman Jeurissen where she obtained her Bachelor in 2009 and her Master in 2012. During her years of Master she made a year of exchange at the Stuttgart «Hochschule for Musik» giving her the opportunity to study with Christian Lampert and Erich Penzel. Before settling in Stavanger, Elske performed as a freelance in various renowned Dutch orchestras such as the Rotterdam Philharmonic, the Radio Philharmonic, the Netherlands Philharmonic and the Royal Concertgebouw Orchestra. In parallel with her career as a musician, she developed an interest in the didactic aspect of the practice of horn and musical performance. His research as part of his master’s degree led him to write a thesis entitled «How to develop a successful children’s concert, an alternative concert program for orchestral musicians». Elske teaches the horn in Stavanger at the «Adagio Musikkinstitutt» school. Laura Lovišková is a flutist from Slovakia. She studied at the Academy of Performing Arts in Bratislava. She is a member of several contemporary music ensembles: Asynchronie ensemble, Veni Academy, Musica Falsa and Ficta or PPPF, with whom she has performed in several festivals such as: Orfeus Festival, Asynchrony Festival, ISCM World New Music Days, Pohoda Festival, Melos -Ethos – International Festival of Contemporary Music. As a soloist Laura has played the Chamber Orchestra VŠMU orchestra and the Slovak State Philharmonic, Košice (SFK). 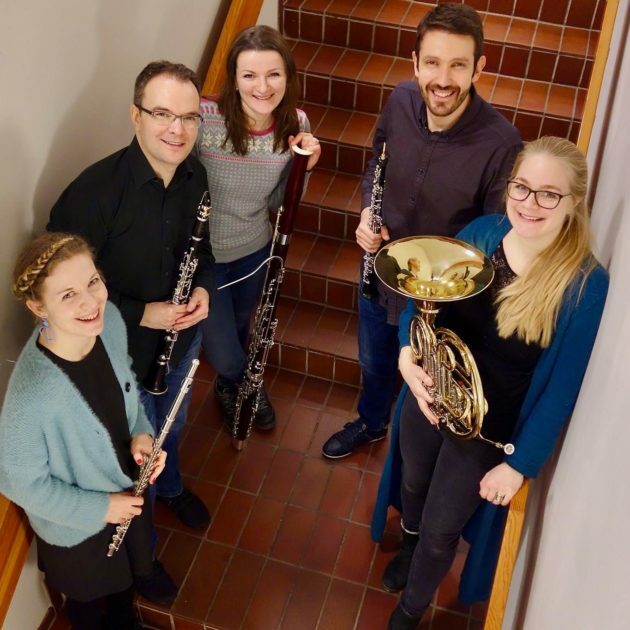 In 2014, as part of the Erasmus program, she went to study in Reykjavik and participated in many Master Classes with: Hallfríður Ólafsdóttir (IS), Leon Spierer (DE) Ann Elkjär (SWE), Moshe Áron Epstein (DE / IL) , Berglind Maria Tómasdóttir (IS), Caroline Debonne (FR), Magnea Árnadóttir (IS), Svava Bernhardsdóttir (IS), Gunnar Ben (IS). In 2010, Laura and her sister mezzo-soprano Izabela formed the group «Ecetera Band» in which she played piano and composed songs in a neo-classical / progressive rock style. Their first album, «Herbergi» is recently released. Evgeniya Leonova was born in Novosibirsk, Russia. She began her musical apprenticeship at the age of 6 with the piano, then chose to study bassoon, and at the age of 16, entered the Novosibirsk Conservatory. At the age of 22, she obtained her first professional position at the Moscow Opera Theater as Bassoon Solo and continued her studies at the Moscow State Conservatory in the class of Mr. Popov. In 2013, Evgeniya enters the Mariinsky Theater of St. Petersburg as Bassoon Co-Solo. She moved to Norway to Stavanger two years later where she participates actively in the musical life. She regularly performs with orchestras on the Norwegian West Coast such as «Stavanger Symfoniorkester» (SSO), «Trondheim symfoniorkester» (TSO), «Kristiansand Symfoniorkester» (KSO). Evgeniya is also a bassoon teacher at the Kulturskole of Stavanger. Milan Adamović began his musical apprenticeship in his hometown of Niš, Serbia, before entering the renowned Faculty of Music in Belgrade where he obtained his Bachelor and Master degrees in Dragan Lazić’s class. From 2010 to 2014, he studied with Kjersti Dahle and Erik Niord Larsen at the Stavanger University of Music and Dance and graduated with a Master and a Postgraduate diploma. Milan is an active chamber musician and chamber musician. He holds the Solo oboe position at Sandnes symfoniorkester and regularly performs with the orchestras: «Stavanger Symfoniorkester» (SSO), The Norwegian Wind Ensemble, Norwegian Radio Orchestra (KORK), Arctic Sinfonietta, Helgeland Sinfonietta, 1B1 and other Norwegian orchestras and Serbian. He has performed at various festivals in Norway and abroad including Risør Chamber Music Festival, «Sound Ways» International New Music Festival in St. Petersburg, Summer Musical Academy in Kotlas … etc. Milan also teaches Oboe at the «Adagio Musikkinstitutt» (Stavanger). Alexis Baldos began his clarinet apprenticeship in France at the age of 7 and entered the class of Richard Vieille and Franck Amet at the «Conservatoire Supérieur de Paris» where he obtained in 2002 his «Diplôme d’études musicales» (DEM) and a 1st Prize unanimously. In 2007 he received the 1st Prize unanimously Clarinet Bass at the «Conservatoire de Créteil» in the class of Philippe-Olivier DEVAUX. From 2005 to 2009, he was clarinet solo at the «Orchester de la Cite Internationale de Paris» and also plays in several renowned French orchestras such as that: the «Orchester de Paris», «Les Siècles», the «Pasdeloup» and «Colonne» orchestras … In 2010, Alexis moved to Norway to play bass clarinet and clarinet in the «Stavanger Symfoniorkester» (SSO) for two years. Between 2013 and 2015, he performed with the Stockholm Kungliga Operan and the Bergen Filharmoniske Orkester (BFO). Alexis is currently a freelance musician and regularly plays in various Scandinavian orchestras such as «Stavanger Symfoniorkester» (SSO), «Trondheim symfoniorkester» (TSO), «Kristiansand Symfoniorkester» (KSO), Arktisk Filharmoni … etc. Holder of the French State Diploma in Artistic Education, Alexis is also professor in charge of the wood console at the regional youth orchestra «Rogaland Ungdomssymfoniorkester» (RUSO) and teaches clarinet at the «Adagio Musikkinstitutt» (Stavanger) .